Tech at Night: People don’t care about Do Not Track. Verizon the target of a coordinated campaign? Bitcoin and Tor are incompatible with liberty and order. 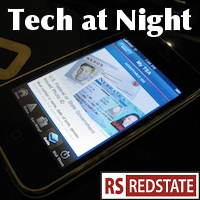 Tech at Night: We need FCC reform. The government that wants to regulate the Internet can’t even Fax. Tech at Night: MPAA misses the facts on Google. Dish Network wins for innovation. Why on Earth would we need Do Not Track legislation when many forms of tracking would be hard to define, but also when Tracker #1 is as popular as ever? This is yet another example where privacy is being treated as a morality issue, where legislators are scolding the public. I mean look. Microsoft talked about making Do Not Track the default setting, but the public didn’t care. Only advertisers did. It’s kind of hard to have a rational debate about Net Neutrality when the radical left keeps lying, and lying, and lying. They have to demonize Verizon because they don’t have the facts or the law on their side. I have to say this Verizon story about a phone and the C block of spectrum (which Verizon is mandated to allow devices on freely as a condition of the auction Verizon won), it all sounds like a misunderstanding designed to whip up a furor against Verizon during this Net Neutrality push. This guy sounds like he’s actually not at all interested in getting a sim, but rather he’s trying to manufacture a Test Case. This is ideology, and not likely an actual problem. He hasn’t even gone to a store. He’s using Twitter. Of course, note that while the the rule requires Verizon not to restrict people from using the devices of their choice, and note, he took a SIM he had, put it in the tablet, and it worked. So he wasn’t actually restricted from using it. Sounds like a big old nothingburger to me. I still think the National Retail Federation has totally botched the whole Internet Sales Tax fight. They overreached, they pushed poisonous rhetoric that divided the issue, and turned conservatives off on the issue. Bob Goodlatte may try in the House, but I don’t really see a chance the Senate bill passes at this point. There’s just too much opposition right now that I’m seeing. Because I don’t really see people dropping the (in my view, questionable) taxation without representation argument based on these proposed changes since, you know, the Senate bill already had an exemption for smaller businesses, but that didn’t stop critics from saying that Grandma on Etsy would get hit. They really ought to trash the Senate bill and start over with something a lot less far-reaching, and pass something that’s opt-in for the states, not something that tries to force states into the deal. There’s a legitimate issue here, but NRF has made it a too-transparent power grab and brazen attack on online competitors who, frankly, are whipping their tails in the free market. More FCC? Steve Scalise and Jim DeMint once tried to pass some video reform, relating to Retransmission Consent which was the heart of the Time Warner/CBS fight, and from what I heard I was inclined to support that. However this idea I’m seeing that Scalise and Anna Eshoo are proposing, to insert FCC as a mediator in disputes, I entirely reject. The problem here, if there is one, is that there’s already too much regulation interfering with the private negotiation between cable companies and copyright holders. The solution is not more government. The solution is to repeal entirely the anti-cable rules that were put into place in the Cable Act, that were designed to give an edge to broadcasters. The whole rule was designed to tip the scales in favor of one business over another. Abolish it. Don’t add more government. Look, let’s stop working with left Democrats on tech reform when it means growing government. Only work with them when it means increasing liberty. For example, we should not pass any laws to punish Google for the failures of the RIAA and MPAA to innovate, as we have passed laws in the past to reward those industry associations. Google is working hard on their own to de-fund copyright infringers by refusing them ad money. That should be enough. It’s not Google’s job to be the Net Police. Oh look, yet another Bitcoin and Tor driven criminal enterprise. A right to total anonymity, which keeps being pushed as an ideogically-driven part of the greater Privacy debate, is not something I’m sure we can support in a free society. Anonymity runs counter to the basic concept of personal responsibility, as it is invariably used by people who wish to do harm to others without taking responsibility. You can’t enforce people’s rights without order and the rule of law, and you can’t enforce order and the rule of law with anonymity. Bitcoin and Tor interfere with liberty. But at the same time, phone unlocking is something we should be able to do. On a basic level, a thing we own, we should be able to modify. Which is why the Librarian of Congress, under the DMCA, previously ruled unlocking was specifically legal. Then the LoC (appointed in 1987) changed the rules and suddenly banned unlocking. Derek Khanna is out there making the case for why this is a problem Why the heck is the Librarian of Congress making this decision to begin with? This is an example of where we can do narrow, targeted copyright reform that rationalizes the law, and brings the law in line with the public’s sense of fairness, which fundamentally strengthens the rule of law on copyright. We don’t need a comprehensive bill, since that’s what created this mess to begin with. We need to make one fix at a time. You could make a conspiracy theory out of the sunrise. No, mate, the story is exactly as I tell it: I bought something that should work on Verizon and they refuse in violation of both FCC regulations and a consent decree against them. Simple as that. “This guy” Jeff Jarvis has worked as a journalist since the mid 1970’s. “This guy” was the creator and managing editor of Entertainment Weekly. “This guy” was the Sunday editor and associate publisher of the New York Daily News. Jeff Jarvis is a noted writer about the Open Web. He is a frequent speaker and panelist for tech, internet and privacy rights gatherings all over the world. Jeff Jarvis is a professor and the director of Tow-Knight Center for Entrepreneurial Journalism at the City University of New York. Those are facts. Here’s another fact: Mr. Jarvis did indeed go first to the Verizon store to get his Nexus 7 LTE activated. He only went to social media, @VZWSupport on Twitter and +Verizon Wireless on Google+, after the Verizon store could not, would not help him. No Mr. Stevens, this isn’t a “conveniently-timed, manufactured ‘scandal.’” Mr. Jarvis has plenty of ammunition to support his Open Web views. This is simply one man trying to get a large company to do what they have promised us all they would do, let us pay them to use their wireless data system on the spectrum we sold them without constraint as to the device used. I believe you are using Jeff Jarvis’ problems getting Verizon to do what telcos all over the world do thousands of times each day as link bait to your Red State tech column. That is nothing that doesn’t happen all over the internet every day by uncounted sites. Except you have taken a good persons fight to get a huge corporation do one simple thing they promised they would do and turned it into a screed against the “radical left”. What is radical or left about keeping the internet open and available for anyone who can buy the hardware and pay the data charges?